Looking for a dashing, wooden, environmentally friendly portable sit-stand desk that is strong and fits in your go bag? Check out the X-Stand. A simple, portable standing desk converter that goes with you. 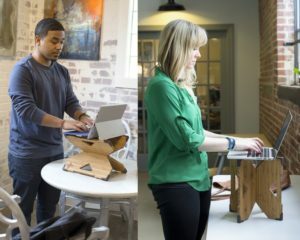 The X-Stand is a simple and portable desk converter allowing you to take a standing desk with you. When you’re at the coffee shop, airport, or client’s work space and you want to switch from sitting to standing you simply take this out of your bag. Slide the two pieces together to form the “X” and set it on the table at your desired height. This desk looks great, is really stable, and is made from FSC certified bamboo. 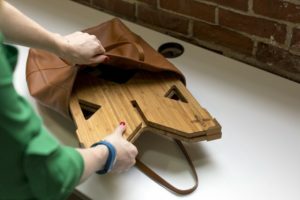 The drawbacks are the lack of a desktop and the difficulty getting it in and out of a bag due to the rubber feet… which also make it so stable. I used this desk around town for several days and it works really well as a portable standing desk. The best feature of this desk is its stability. The large rubber feet are excellent at gripping the desk you place it on and the laptop you place on it. The desk comes in a box with the two pieces packed flat and no assembly is required, other than to make the X when you want to use it. Note that the X-Stand is as simple as it gets. It doesn’t come with a desktop so if you have a really small laptop you may be limited in the heights you can use this stand. Compare the X-Stand to the StandStand to understand what I’m getting at. Assembling the X-Stand could not be easier. In a way, no assembly is required because it comes in its ready-to-go state. Once you are ready to put the X-Stand to use you simply hold one piece in each hand with the two slots that are in the middle of each piece facing each other at a 90 degree offset. Insert one in to the other (to form an “X”) until they lock together. Now place it on the desk or table or counter you want to use as a stand and you’re ready to go. I like to mention a bunch of other ways you can use the products I review because, though they are intended for a single use, there are often many you can get value from. Here are some of my ideas. Be sure to share more in the comments. Thank you to Adriana for providing an X-Stand for me to review so that you could get a real review, not one just based on pictures and web pages.